‘Sexist’ cabinet reshuffle forces women to bottom of the ‘power list’, with … Daily Mail The row over David Cameron’s ‘sexist’ Cabinet reshuffle was revived last night with the release of the official ministerial pecking order. 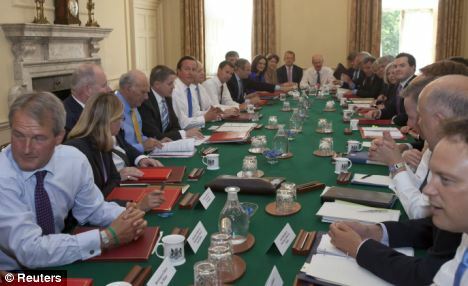 The ‘power list’, ranking the 22 members of the Cabinet, reveals that two out of the four women are among the bottom three positions. Only Welsh Secretary David Jones – who comes last, and was appointed from a tiny pool of Welsh Tories – has been placed lower than Northern Ireland Secretary Theresa Villiers (21st) and Culture Secretary Maria Miller (20th). Women sidelined in shake-up, say critics Financial Times (Registration required) Yvette Cooper, the shadow home secretary and shadow minister for women and equalities, said the reshuffle demonstrated the prime minister’s attitude to women. “David Cameron has always had a blind spot when it comes to women,” she said. First woman joins list of candidates bidding to become Humberside Police and … This is Scunthorpe The Liberal Democrat party has announced its prospective candidate to become the region’s first police and crime commissioner. Simone Butterworth, a former leader of Hull City Council, is the first female candidate to stand for the elected post. Previous postGender Parity Crisis Looms in Kenyan Parliament, Why aren’t there more women in South Australian politics?